K-pop artist Alexander Lee Eusebio is content with what he has achieved, three years after leaving U-KISS and launching his solo career. “I’m happy because I got to experience a lot,” Alexander told Bulletin Entertainment in an exclusive interview. The singer and actor flew to Manila last July 26 to celebrate his 26th birthday with local fans. The intimate gathering, organized by FangirlAsia.com, was held at the Philippine International Convention Center (PICC). During the bash, Alexander and his fans enjoyed playing games and eating the sumptuous food catered by Via Mare. There was halo-halo, which is equivalent to Korea’s “patbingsu,” and other Filipino delicacies such as cassava cake, palitaw, biko and pichi-pichi. It was an up close and personal encounter as Alexander hopped from one table to another to talk to his fans. He also allowed fans to take their pictures with him. As his way of expressing appreciation for their love and support, Alexander raffled off gifts for attendees. One fan, Anna Usoltcova, 28, came all the way from Saint Petersburg, Russia, to attend the shindig. “He’s very kind, very down to earth. He has this great attitude towards his fans. He’s not afraid to be really close to them like today, for example,” Anna said. 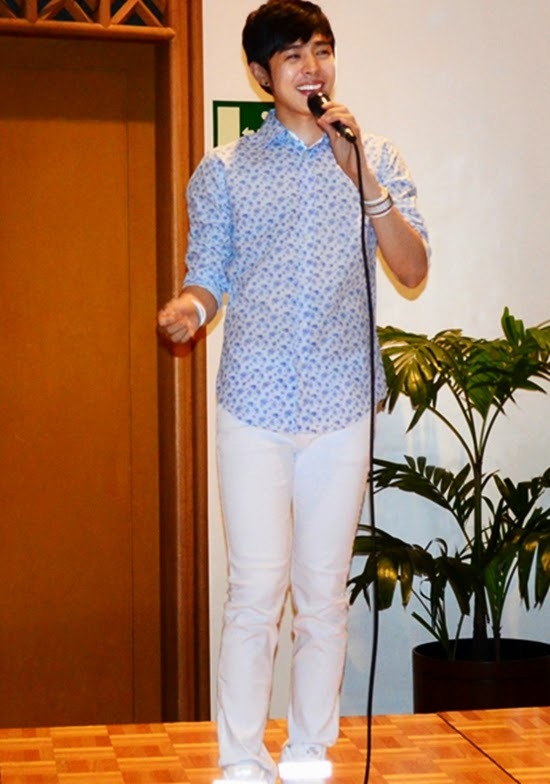 Anna Victoria Dela Vega, 18, who flew to Manila from Antique, said U-KISS was the first K-pop group that he liked and Alexander was his first love. “Yung personality nya ang ganda. Unang kita ko sa kanya parang ang bait-bait niya,” she said. At the party, all-female singing group Miles performed and serenaded Alexander. Alexander related that he was “quite emotional” during the party. “I had a lot of thoughts. I haven’t been working for a long time. During this process, I have been thinking should I continue or not, or should I just give up. Then, everybody here in the last minute, paying for the tickets, typhoon–all these circumstances, I really appreciate it,” he said. He is thankful how some of the fans even went to the Ninoy Aquino International Airport to welcome him. “I was suprised actually. I thought, ‘Let’s just cancel it, let’s just not do it.’ But still they were there because we had to go on. I really appreciate it,” he said. Last year, Alexander got his first big project when he starred in the movie “3 Peas In a Pod” with Calvin Chen and Jae Liew. “It was good except the fact that Singapore is a bit strict so it (was rated) NC 16 [No Children Under 16] so a lot of our fans couldn’t watch it,” he said. After the movie, he became busy with 3rd Wave Music, a Christian band headed by Johnny Lee and Brian Joo, one half of the K-pop duo Fly to the Sky. This year, he is putting his career on hold, having enrolled at Korea University, one of the top three universities in South Korea. “I’ve been busy studying a lot because it’s my first semester,” he said. “One of the biggest reasons is I promised myself and my family that I will continue studying no matter what. So I think now is a good timing,” he said. Alexander said he has a new entertainment agency, which allows him to focus on his studies. “I hope that they could give me more freedom to study. I’m not sure about the next semester but probably I have to work,” he said. As for his career, he’s inclined to do variety shows. “Nothing is really confirmed yet but you can expect a lot of variety shows. My company hopes that I do more towards acting. For me, I prefer variety shows. And music, I would say, If I have the chance, because it’s unavoidable, no matter what. Basically, I have to do everything,” he said. He admitted that going solo is hard. “The good part is I get to choose what I want to do. The bad thing about it is that it is stressful. I have to handle everything alone–speaking alone, performing alone. Quite a heavy workload,” he explained. Alexander told Bulletin Entertainment that he’s not really sure where his career is headed at this point. He stressed, “I am happy but I still am not sure which way I should go. I had my own movie. I was in a K-pop group. Obviously I have noregrets. I already experienced more than enough but I don’t want to stop yet. This is my passion,” he said.